Catering to users who require a chassis with exceptional ventilation and considerate design features for user-friendly installation, ASUS, producer in top-notch computer chassis, has today released the new VENTO TA-D Series Chassis. Comprised of the TA-D1, TA-D2, TA-D3 and TA-D5 (released in April this year), this series of chassis utilizes a sturdy yet aesthetically pleasing design that incorporates various innovations with considerate design for easy installations. 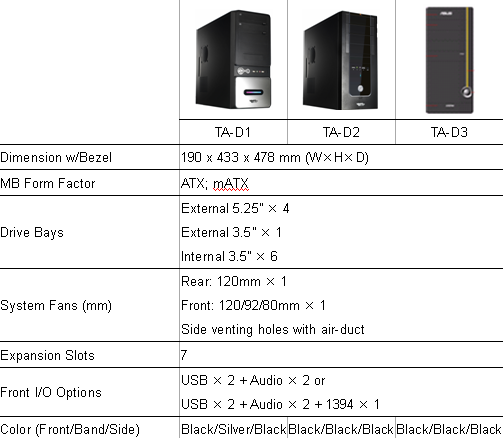 Additionally, the VENTO TA-D Series also provides an advanced ventilation system that maximizes thermal efficiency for key components – especially the CPU and graphics card. The VENTO TA-D Series supports both front and rear 12cm large fans for maximized airflow – allowing it to meet the Intel TAC compliance for excellent thermal efficiency. Once the front fan draws in fresh air into the casing, the heat generated from the system will be expelled immediately via the rear fan – providing efficient airflow for cooler temperatures; while CAG 1.1 side vents with air ducts provide cooler air from outside the chassis that lowers CPU and video card temperatures. Through the adjustable air-duct, airtight contact with the CPU is ensured to efficiently funnel the cool air towards the CPU while unique rear venting holes enhances ventilation around the add-on cards. This optimized thermal efficiency enables long and continuous operations for the most powerful processing platforms and increases overall system performance and stability. For the sake of convenience, the intelligently located USB ports are separated from each other – allowing users to easily connect multiple USB devices without mutual interference. 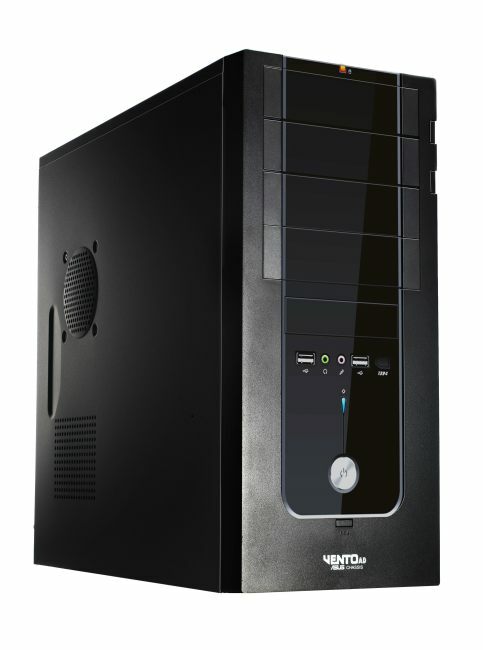 Other user-friendly features of the VENTO TA-D Series include: both side and front vents are also equipped with dust filters to help keep the system clean; folded metal edges that protect fingers from scrapes and cuts; a spring-operated optical drive door for quick access to optical devices, and thumbscrews for easy removal of the side panel. For the VENTO TA-D1, the matte black-coated paint finish exudes a subtle charm, while the lower faceplate is comprised of a shiny metallic-like surface with the innovative multi-colored power LED. This LED will shine red as a power indicator throughout system operations, and a blue hue will flash whenever the harddisk is being read – creating a pleasing ambiance when in use. The TA-D2, on the other hand, presents an aesthetically pleasing glossy-black finish, while the LED HDD indicator is located at the top of the chassis; and the power LED is found on the bottom. The TA-D3’s distinguishing aspect comes from the blue LED light that surrounds the power button when switched on, and flashes red when the HDD is in use. The matte black finishing with a bold yellow strip on the front bezel presents itself boldly and lends an air of distinguished computing.